When my alarm went off at 5:00 am on the morning of the 21st of February, there is nothing I wanted to do more than to roll over, turn it off, and then go back to sleep. I haven’t had anything to really get me out of bed so early since arriving in Japan and I really just wanted to keep snuggled into my bed. But then I remembered, today is the day I get to visit the elephants. When I first decided to sign up for the Green Hill Valley Elephant Conservation Trip, I did my own research on the location and found that the mission of the program is to give comfortable and loving homes to elephants that are retired from the government timber industry. They sometimes lease out elephants from the government that are still working to make sure some elephants get their time to rest and relax away from their forced labor jobs. We later found out that the location also works with maintaining and planting trees in the area and also recycling the elephant poop to make paper and papier-mâché elephants that they would paint and sell in the gift shop. Even their gift bags were made from the poop paper, thus creating a sustainable product for their guests that take little to no money to create yet brings income to the camp. You know they are really doing everything they can for and with total focus on the elephants when you first walk up and you see the sign about needing an appointment to come visit. They don’t want hundreds of people a day, they want a few to sustain their income to help, and to continue to educate the visitors. I can tell you it worked. My first experience with an elephant that day was bathing her in the river. I honestly was near tears with how amazing the moment was. Elephants have never been one of my favorite animals, but I just had this sudden overwhelming surge of emotions and I just had the need and want to share my experience. I want to bring my boyfriend here, and my mom and dad here. It was just such an amazing experience that I want everyone I really care about to be able to experience it. It was a very an emotional day and I guess I could say I am very happy I didn’t end up hitting my snooze button that morning. Myanmar is a gorgeous country and it was an amazing opportunity to get to see a country that isn’t yet heavily influenced by tourism. Myanmar has the potential to bring in many tourists in the future but if they continue the way they are, their trash is going to make no one want to visit. There is currently no way of controlling the garbage flow in Myanmar. Right now, people either just throw their trash on the ground or burn it and that is not sustainable. This issue could be seen everywhere but it was most prevalent to me when I went to the Golden Rock Pagoda. The pagoda itself is beautiful and the area around it is breathtaking but there was a bad smell in the air that distracted from the beauty. When I looked over the railing, I understood what where the smell was coming from. It was clear that they have been simply dumping their trash off the railing of the pagoda for years and it is starting to really add up. The smell distracts from the destination already but if it gets any worse, tourists aren’t going to want to visit the area anymore, not to mention the negative impact the trash has on the environment is no good either. Myanmar needs to establish a garbage control system soon before their garbage ruins their county’s opportunity for tourism. There are 3,000 pagodas to see in Bagan, an ancient city in the Mandalay region of Myanmar. I only had one full day to see as many of these pagodas as I could, so I was presented with a challenge to find the most efficient way of doing so. My friends and I stayed at the New Wave Hostel, which was conveniently located in Old Bagan (near many of the aforementioned pagodas). The friendly woman working the reception desk at the New Wave asked us if we would like to rent “e-bikes,” electric bikes, for the next day. At only 7000 kyat/day (about 5 USD) it was a no brainer. The bikes provide a cheaper, faster, environmentally friendly way for tourists, of which there are many, to get to as many pagodas as their hearts desire while in Bagan. An amazing sight to see! Looking out at the hot air balloons beyond the pagodas, I was fairly certain that I had never seen a more beautiful sunrise in my life. We had arrived early that morning in Bagan, an overnight bus ride from Yangon. After stepping off the bus at 4:30am, we got in a taxi and set off in search of the perfect pagoda to watch the sunrise. At first when our taxi driver stopped the car and told us to get out I thought it was a joke. We were absolutely in the middle of nowhere, with only dirt and minimal plants surrounding us. His flashlight lit the way down a narrow path to what looked like ruins about to fall apart any second. We removed our shoes, and climbed the steep and cramped staircase. The moment we reached the top, I understood what all our efforts had been leading towards. The view was absolutely magical; a collection of lit-up pagodas stretched out before us as far as I could see. As the stars disappeared and the sun came into view, the scene only became more beautiful. One aspect that struck me was the lack of major buildings in Bagan. Later in the day as we zoomed around the city on e bikes, it became even more apparent how truly untouched these pagodas still are today. I am used to finding old buildings on the bustling street corners of historical city centers, not sitting out in the open waiting to be admired. I easily could have spent another month in Bagan and never tired of watching each sunrise and sunset, shoeless at the top of a dusty pagoda. 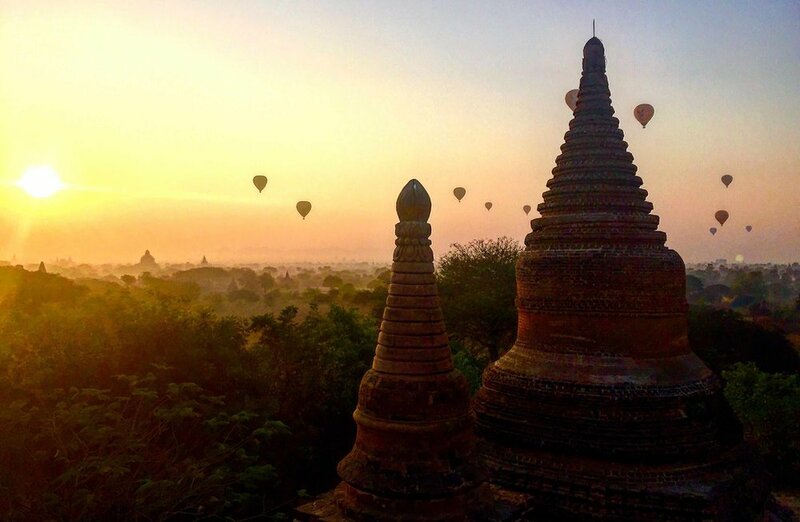 Is Bagan on your bucket list yet? Scenes from the Shan region of Myanmar to Kochin, India.